The Guardian of Forever appears again after TOS: "The City on the Edge of Forever". This time, the time portal is used on purpose by time travelers Kirk, Spock and Erickson to explore the history of Orion. When the three return, McCoy, who is waiting in front of the Guardian, doesn't recognize Spock. The first officer of the Enterprise is an Andorian named Thelin in his timeline. This is inconsistent with the depiction of the Guardian in TOS: "The City on the Edge of Forever" where the crew members standing in front of the portal were protected against timeline changes, just like the time travelers themselves. 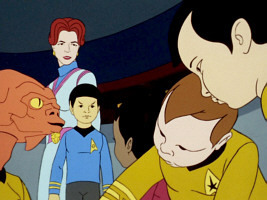 In the TOS episode, Scotty and Uhura were surprised that the (unprotected) Enterprise was gone after the changes that Kirk, Spock and McCoy had caused in the past. 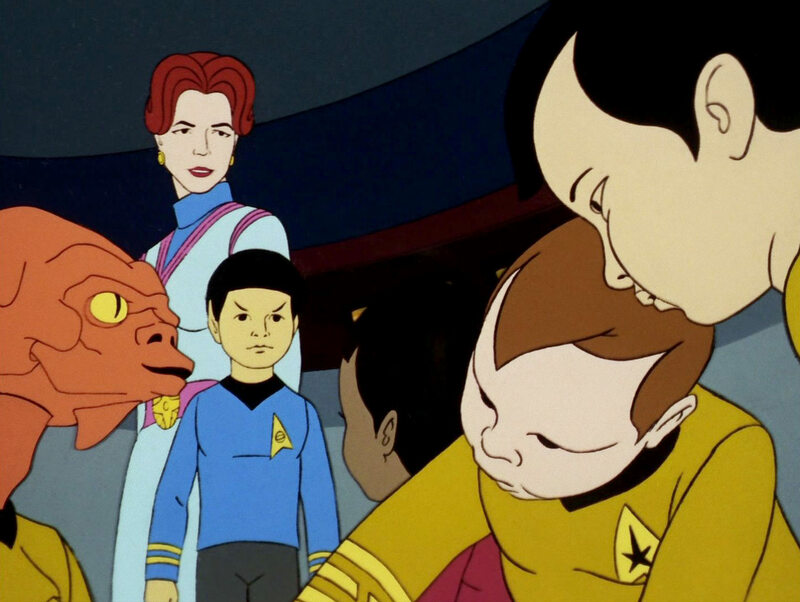 Anyway, in the TAS episode it turns out that young Spock was killed on Vulcan during the kahs-wan ritual. In the original (or rather: familiar) timeline, Spock's cousin Selek would have been there to save his life. Spock has only a faint memory of those events, but he realizes that Selek must have been he himself at an older age. His time travel to Orion's past is cited as the reason why he couldn't be on Vulcan to save his younger self: "You couldn't be in two places at once, so you died as a boy." So although there should be no reason why Spock couldn't travel to the past twice, it seems that the Guardian of Forever allows just one time travel at the time, and somehow resets everything else that has been changed (or will be changed?) to some sort of "default value". The question is why the same didn't already happen when Spock first used the Guardian of Forever in TOS: "The City on the Edge of Forever", with the reasoning that he couldn't travel back to Vulcan when he was in Earth's past. It is clearly a predestination phenomenon that Spock was saved by his older self, and that Spock would have to travel back to Vulcan as "Selek" to accomplish something that already happened. Yet, in a previous timeline Spock's sehlat I-Chaya did not die. Young and adult Spock in TAS: "Yesteryear"
Sarah April and rejuvenated crew in TAS: "The Counter-Clock Incident"
During a battle, the Enterprise and the Klingon cruiser Klothos are caught in the Delta Triangle, which is described as a different time continuum. Spock calls the phenomenon "another place in time", but doesn't get more specific. Inside the phenomenon, time is said to pass very slowly. This may refer to time being slowed down here relative to the outside world, or to those living in the Delta Triangle being very long-lived. The evidence in the episode could be interpreted both ways. Xerius of the Ruling Council threatens to freeze the Enterprise and the Klothos for a century: "A century means nothing to us." But we don't know whether he refers to a century of his time or of the outside time. Spock scans various hulls of stranded ships. He states that "some of them have been here for centuries", which may indicate that they have aged accordingly, or that they are simply old designs (in astonishingly good shape). The appearance of the first warp ship Bonaventure (which was probably meant to be some 200 years old at the time) in a rather pristine condition is a hint that it has not aged as fast as it should have. Yet, Spock also says that the "crew's descendants may still be living". Why not the crew themselves if time passes very slowly? It ultimately has no story relevance whether the Enterprise and the Klothos were trapped in another time or "only" another place. They escape and apparently arrive just where and when they started. "Time stands still inside a stasis box. A billion years means nothing in there." This means that the stasis box built by the Slavers allows objects inside to travel to the future. Effectively, the boxes may not involve actual time travel but may just be perfectly isolated containers that avoid aging. 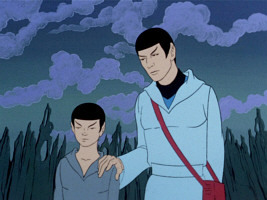 Kirk and Spock join a secret team that sets out to retrieve the "Soul of Skorr". When they are beamed up to the ship again, they learn that they were gone for just two minutes. In the negative universe, many but not all principles of physics are reversed. The aspects that are reversed are very selective, and don't make sense as such. The stars, for instance, appear black in white space, but everything else looks normal. Most notably, time runs backward in the negative universe. More specifically, the direction of aging processes and of clocks is reversed, whereas in all other regards the causality still works like in our universe. The inhabitants of the negative universe are born at an old age (like Karla's "son") and die as infants (like her "father"). Does that mean that ancestors are born after their descendants, as Spock assumes? Is it really a reversed causality in just this one regard, or rather a matter of strange biology?